I thought I would add a bit of colour into a wardrobe that was fast turning grey. And how! Mustard was a very deliberate choice in that I don’t think that I have any other clothes this colour, so it stands a chance of going with several ‘bottoms’, and it is also trendy this season. Some of my outfits are really quite cheap – that’s one reason why we all sew. This isn’t. It’s ‘selling point’ is that it is unique. It started with the remains of the fabric from my recently completed draped dress – the body. The grey sleeves are an almost perfect match for the body colour and the collar is a total, and rather unmissable, contrast. Each of the fabrics was over £10 per metre, so the whole jumper cost somewhere in the £30 – £40 region, which is M&S price. I daren’t wash it….. The body fabric washes fine. I just threw the other two into the washing machine, and then rather wished that I hadn’t. The mustard, which contain wool, and is quite warm with a double layer around the neck, mis-shaped very badly, and I was much concerned about finding a straight grain. It is definitely not cut on the straight grain, but luckily, the styling is such that I think I have got away with it. I thought that the sleeve fabric was fine until I came to lay the pattern piece onto it, and it wouldn’t fit. It must have shrunk – which to be fair, is a general warning that comes with jersey fabric – and I had only bought just about enough. (We had to lay out the pattern pieces in the shop to find out how much I needed for each – but you can do that at Guthrie-Ghani – that’s one reason why I go there!) With much pressing and a bit of stretching I did eventually manage to fit the pattern to the right grain, and in the end ended up cutting off some of the length, even though I had already shortened the pattern. But now you see why I daren’t wash it again. It is relatively easy to make, although I did not pay full attention to the instructions and under-stitched the wrong side of the collar. Given potential fragility of the fabric, I decided not to unpick, but to go with what appears to be a top-stitched edge instead. Luckily I did it quite tidily. Given a cross over front, there are two layers of fabric down the front, and limited guidance about how to finish the bottom, other than turning a hem. So I pinned it and then left it for a while to ponder the best approach. Amazingly, I found inspiration on the underground, just looking around at what people were wearing. Does anyone else do things like that? So it is finished with a bias cut strip of the sleeve fabric, overlocked to both front pieces, and then hand stich to itself on the inside. Maybe it would have been better cut straight, but bias binding is cut on the bias, so that’s what I did – and then pressed hard! I had to pin it carefully using the dummy to get the hang of the fabrics correct. I like this finish. Not only does it frame the garment quite well, but it lengthens it very slightly, which I think it needs. 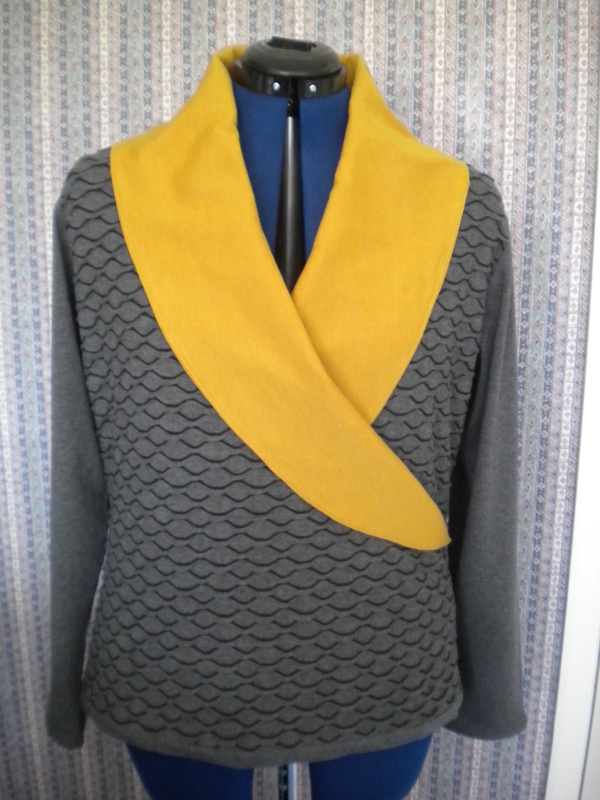 This entry was posted on November 1, 2014 by ann hebden in Fashion, Jumpers, Sewing, Tops and tagged Fashion, Handmade, Jumper, Sewing, Tops.